As a former Special Education teacher and a mother to two boys on the Autism Spectrum, the best thing you can do for your child with autism is to be their voice. The path to a successful life for your child depends greatly on you, their parent. I understand completely how everything that comes with a special needs child can truly be overwhelming. My boys were diagnosed after I received my bachelors in special education so I fully had an advantage over most parents. I had the experience of writing IEP’s (Individualized Education Programs). I knew exactly what my boys needed when they were diagnosed. However, many parents do not have the advantage like I had. IEP’s can be and are very overwhelming for parents. The special education laws are not written for parents to understand. 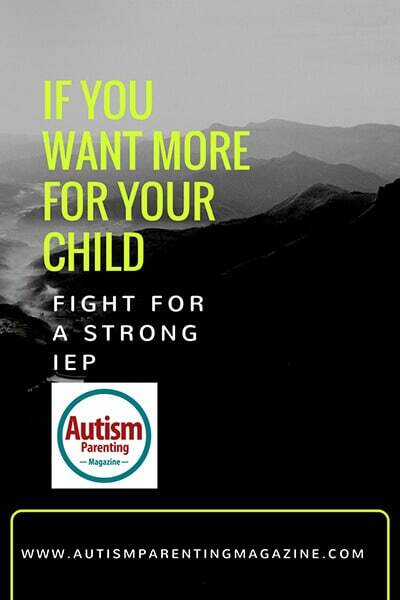 The majority of most parents walk into the IEP meetings trusting that the school will give their child everything that they need. The parents are not the ones with the degree in special education. Therefore, they are ready to accept and agree with what the special education team has to say. However, no one knows the child better than the parent. If you want more for your child, fight for it. If you don’t like what you are hearing, say so. Stand up for your child and be their voice. Don’t be afraid to ask questions.The special education team wants you to ask questions. They want the parents to understand and to be an active participant in their education. In fact, if you prove to them that you are involved and want to understand the whole special education process, I guarantee your child will get almost everything that you want for them. If the team refers to a law or policy, ask to see the policy. It is your right as a parent. I would highly suggest to always ask nicely in order to not offend them. However, don’t be afraid to ask and see everything. It is your right as parent. I am fully aware that it might be intimidating to walk into your child’s IEP meeting or any meeting in fact. This is why I highly suggest to make sure you go to the meeting with another person. It doesn’t matter if it is your spouse, neighbor, friend, or an advocate from your local agency, but you need another person to help be your child’s voice. The person you bring along should take notes and write down all important information. This will help you tremendously after the meeting. You will be surprised on how much you will forget after walking out of the meeting. The notes are guaranteed to help trigger a question for your special education team later down the road. It is not easy to understand all the polices and everything that special education entails. The special education team doesn’t expect the parents to understand all the policies in special education. However, the more you know, the more you will help your child. No one is a better advocate for their child than the parents. Therefore, stand firm and be your child’s voice. Be involved and show your child and their special education team that your are just as much a part of the team as they are. Angela Conrad is a former Special Education teacher. She is a mother to two boys on the autism spectrum and a strong, autism advocate. She is the Walk Chair for the Walk Now for Autism Speaks in Terre Haute, Indiana. You can follow Angela’s page on Facebook, Two Brothers One Journey.